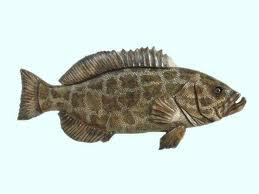 Groupers are members of the sea bass family, Serranidae, which has over 400 types. Red grouper (Epinephelus morio) and gag grouper (Mycteroperca microlepis) are the groupers harvested in volume and most readily available in seafood markets. Black grouper, scamp, snowy and yellow edge grouper are also available but are harvested in smaller volumes. Groupers vary in size and weight, but are commonly marketed at 5-20 pounds. They are found in warm temperate tropical waters around the coral reefs and rock outcroppings of the coastal shelf. Groupers are harvested year-round with peak Eastern seaboard and Gulf production in summer and fall.Characteristics: The extra lean white meat is firm and moist with large flake and a sweet, mild flavor. 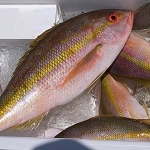 Substitutes: Yellowtail Snapper Fillet and Filet Mahi-Mahi. Best Grouper I have had since I caught my own. Well packed, arrived fresh and cold. First time to eat Black Grouper and these fillets were exceptional!! Very fresh, very tasty...will purchase them again!